Who Can We Expect to See Firing for the Ducks? For a team that was ranked in the Top 10 in preseason, the Ducks are in a position few expected in February. With 16 games remaining, the Ducks need to win at least 10 in order to have a chance at making the playoffs. They have fallen short of preseason expectations, but have showed great resilience, finding ways to win despite injuries and struggling stars. 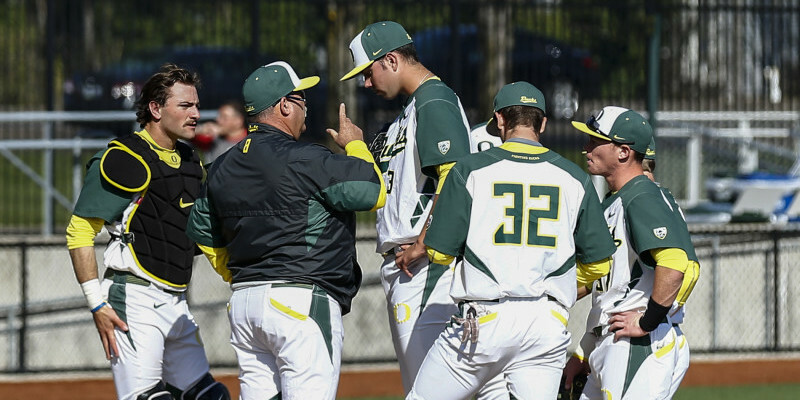 With the Ducks’ bats coming back to life against Washington, the question that remains is: Who on the pitching staff will help lead the charge to Omaha? After Irvin, the rest of the picture is fuzzy, to say the least. Conor Harber was promoted to a starting role after a hot start relieving Irvin, while he was on a pitch count to begin the season. His 2.80 ERA and 0.880 WHIP earned him a promotion when Jack Karakker went down with a season-ending elbow injury. Since his transition, Harber’s success has been tempered – his ERA as a starter has ballooned above 8.00, and he has watched his K/9 drop from 10.08 to 8.50 since mid-March. Harber’s struggles have sent him back to the pen where he was absolutely dominant, sporting a 2.88 ERA and 0.880 WHIP. Graham’s suspension cost him a second career start. Josh Graham was set to take Harber’s place in the rotation this weekend, but his suspension for violating team rules will force the Ducks to hold to their “Next Man Up” mantra. The 2-0 catcher/pitcher was brilliant last Sunday against Washington, allowing three hits and one run over five innings of play while striking out four. Graham has excellent control for a part-time pitcher (3.17 BB/9) and has the stuff to blow guys away (9.5 K/9), although he prefers to pitch to contact in order to preserve his arm. The coaches like what they have seen from Graham, and he could have a bigger role entering the home stretch. 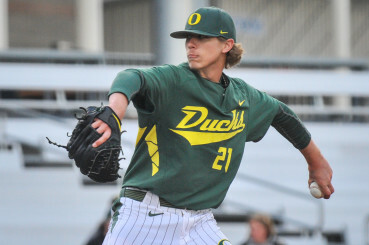 Trent Paddon has appeared in 29.2 innings for the Ducks, and a 9:26 BB to K ratio may have earned him a Sunday start in the Ducks’ next series. Last Sunday he delivered in a precarious, bases-loaded no-out situation, preserving the chances to come away with the win. “I’ve had bright spots and I’ve had dark spots,” he explained Wednesday afternoon. “I just need to prove that now it’s going to be consistently better.” An important Pac-12 series with Stanford will give Paddon that opportunity. With Paddon earning a chance to become a weekend warrior in the rotation, it appears that head coach George Horton is willing to continue stretching his bullpen. That flexibility could open the door for another young star in the wings. Jacob Corn may be able to help the Ducks in the near future. 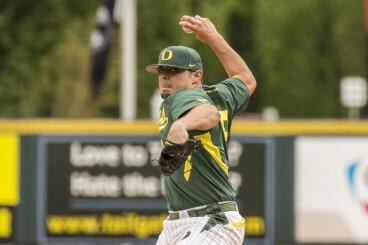 Jacob Corn is a freshman who has had quiet success for the Ducks. A 4.50 ERA is inflated by a single poor appearance at San Francisco when he allowed six runs over 2.2 innings of relief. Corn’s numbers are far better as a starter this year: His K/9 drops from 6.5 to 2.6, but his ERA of 17.56 in relief appearances shrinks to an impressive 2.64 ERA in three starts. Add to his line a 1.47 WHIP and only 4.2 BB/9, and the man from Manteca, California, could prove to be a pocket ace for the Ducks. Almost all of the Ducks games over the final month of the season will take place within the Pac-12. Oregon will play two games against Oregon St. on May 9 and May 19 which will not count toward conference play, along with a two-game series against Gonzaga on May 12 and 13. Oregon has the chance and challenge to raise its RPI by facing the Beavers twice, as well as closing out its season at home against UCLA, the 2 team in the country, both in RPI and overall standings.